« Where do you like your outfit variety ? I keep talking about getting a well fitting starter block, then using it as the basis for patterns. But what I find myself doing in real life is start from a basic commercial pattern, and alter that to fit and flatter. Then using that as the starting point for other versions. I’ve found I have to do most of the fitting work anyway even if I use personalised drafting methods or fitting aids, which assume a more average body than mine (see my post on fitting aids). So I might as well work by getting the fit of a commercial pattern right, rather than drafting or using a fitting aid and then still having to make all the fitting changes. Asked a question about this at Stitchers’ Guild, and got some interesting and wise replies. – alter a pattern to fit and flatter, and find you’ve made so many changes the result could count as a different style. But getting a different style was an incidental output of the process, not the intended outcome. It’s this second process I’m commenting on here. I have two clear examples, which I’ve come to different conclusions about. I wanted a version that fits well and looks good, and assumed I would make minor changes. But the original patterns I chose obviously aren’t good starting points for me, as nearly every proportion and curve of my version is different from the original. So it could count as a different pattern. This post on a loose pullover drop-shoulder dartless top. Second post will be on a raglan top. Last year I did a lot of work on fit and flatter of a casual pullover top. The most basic dartless top pattern has front and back armholes the same, which doesn’t give anywhere near a good result on my high round back and sloping shoulders. I added shoulder darts, changed shoulder slope, changed body and sleeve length and width (front and back not the same), changed shape of armhole and sleeve cap so they fit well, changed to a more flattering neckline for me. The only thing unchanged was the parallel sides of the body ! My starting point was Taylor Made Designs Sew-Easy Shirt by Cindy Taylor Oates. I think I could have started from several other commercial patterns (or drafted my own from the instructions at Burda Style) and had to make similar alterations. Perhaps Cutting Line Designs Two x Four. or The Sewing Workshop Hudson top. Here’s the front of my version (white) compared with Cutting Line 2×4. Look at the middle line of the commercial pattern. Well, mine is the same width at bust level ! There are many similar casual top styles. (For general comments on this type of casual ‘dartless’ block, see my post on them.) I decided my version is one of the large family of slightly drop-shoulder loose fitting top patterns, and I needn’t mention the original designer. Many people would acknowledge the starting point even for such a generic design. I would mention Cindy Taylor Oates if I used her piecing inspiration. Perhaps some of you are like me, and daunted and amazed by the pristine muslins people show in their blogs. 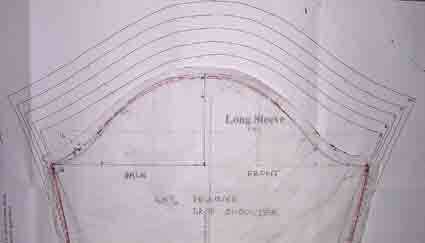 So here is part of the armhole development for my personal sloppy top pattern. 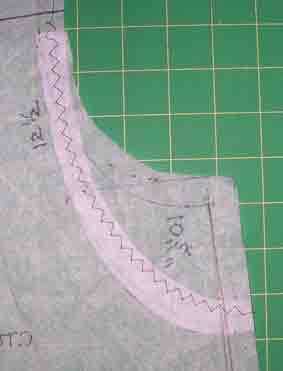 Made using swedish tracing paper, which I love – trace the pattern and mark out a sewable trial garment in one step ! A little stiff and no ‘give’, so not for testing draped or bias designs. Many people prefer to use fabric, but my first trial of a pattern is usually far from a good fit, and this is excellent for showing all the sags and strains. Here’s a comparison of sleeve caps, my muslin and the original. My version is the final one of several as I looked for a way to match sleeve cap to new armhole. Compare with the middle original line. Obviously big changes to armhole and sleeve needed to get a good look on me. 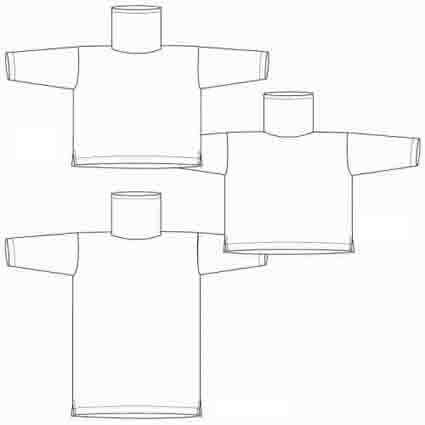 – front and back armholes and sleeve cap different. The usual casual drop-shoulder pattern, with front and back armholes and sleeve cap the same, doesn’t fit well on my rounded shoulders. I consider the ‘muslin’ is a working tool, and I like seeing evidence of the alteration steps I’ve gone through. Other people greatly prefer tidiness. Some people make a new muslin each time they change the fitting pattern. That approach I confess would drive me wild with boredom. An interesting process, especially now I’ve done enough pattern work to be happy with slashing and spreading and generally altering. In the confident expectation it is possible to get there in the end ! Not a feeling I got from working with ‘easy fit’ tools of any type. I definitely didn’t enjoy my initial stages of learning to fit, as ‘easy’ fitting aids didn’t work for me, and much-recommended fitting texts didn’t include the guidance I needed. I had the same lack of success with pattern making software, and with the personal slopers produced from drafting instructions in pattern making books. I felt lost and confused. All these people telling me their method produced marvellous results – and on me it looked terrible. . .
Now I have Liechty & Co’s Fitting and Pattern Alteration book. I now know that all those ‘easy’ methods which claim to work for everyone actually only deal with about a quarter of all fitting issues. I know more about what I’m doing, and expect to experiment rather than get it right first time. It was also exciting to find this sort of boxy top doesn’t have to look bad on me – I’m so used to that from RTW I thought it was part of the style ! Well this has turned out to be more about muslins than attributing the origin of the design. . . This entry was posted on November 17, 2012 at 8:44 am and is filed under fit of clothes, pattern making for clothes. You can subscribe via RSS 2.0 feed to this post's comments. Both comments and pings are currently closed. Hi on fone pls frgve bad letters! So v interesting. Your changes not that different fro mine in scale. No rule of thumb here, but wonder what designer would prefer wretched fit and “faithful to pattern” to stellar fit achieved with much alteration? More ps: muslin!!!!!! Flipping auto-substitution!!!!! Good point Steph and I too get very aggravated by my automatic spelling corrector – yes , I’m a haphazard typist so I ought to thank it, but it does have odd consequences. . .
My opinion is that you should credit the original pattern or design, but also tell of your changes for your own use. Otherwise, readers might expect to buy the same pattern and achieve excellent fit without personalizing it for their own bodies. When you explain your changes, it is educational for your readers. Crediting the original will leave your conscience clear and your readers’ opinions of your work unsullied by suspicions of uncredited copying. It is admirable to see a person choose an attractive pattern and have the vision and skill to make it perfect for her own body, as you do. Thanks for your kind comments Carol. Perhaps I shall find myself agreeing with you in practice – after all I did mention Cindy Taylor Oates several times in this post 😀 Perhaps we bloggers need to mention clearly both the source and all the changes made, so as not to mislead. I also credit the original even if I made many changes, whether for fit or design. Thanks Shams, obviously I’m going to have to give in on this – though I do find this top a _very_ generic style ! Lisanne, I identify with much that you say – I also have just earned the “afterglow” of having a muslin that fits beautifully, after two years of hard slog! For me, the aha moment came when I acknowledged that NO draft was going to give me the back neck and shoulder fit that Kathleen Fasanella (fashion-incubator dot com) describes in her book. Kathleen’s contention is that all garments hang from the shoulders and until one gets these right, one will always have fitting problems. My shoulders are also narrow, are different widths and heights so I have different lefts and rights, front and back. In the course of this week I am going to be putting all this together in a short-sleeved blouse in a non-stretch cotton fabric – the moment of truth! For my casual pullover top I am going to try the “Y” bust dart alteration from Palmer/Pletsch “Fit for Real People”, that I read about on Sham’s blog (thanks, Shams!). I might still need little darts for a more flattering fit. I do enjoy your blog, and am glad you seem to be back in full force since your spell in hospital – well done! Thanks Mandy. As I have problem shoulders too, I’m always surprised by people who do the shoulder fitting late in the fitting process. I confess I have not found the Palmer-Pletsch fit books helpful, perhaps because I don’t need an FBA. I always have fit questions that they don’t answer. Hurrah for Liechty et al. And thanks for the good wishes – I’ve been very fortunate with my health this year, and am continuing to improve. I think you’re confusing 2 very different things – dartless and square. There is no reason why a dartless block should necessarily have a sleeve that’s the same front and back for instance. In fact to me dartless means you have to pay -more- attention to fit around armholes and sleeves, if you don’t want a real potato bag effect (and I don’t just mean loose either, that’s yet something else). But to get back to your original point, I’m a bit puzzled by your approach. You say that because of nonstandard body it’s easier to start with a commercial pattern and then put your fitting changes in. On the opposite, because of my nonstandard body I start with a fitting shell, and then put on it the design points of a commercial pattern. I get fine results that way, things that look like the designer’s intention but that still very much fit me, while I’ve never had much success with the opposite. Well Marie-Christine as usual with you on the topic of fitting I do need to be more clear about what I’m saying. 1. 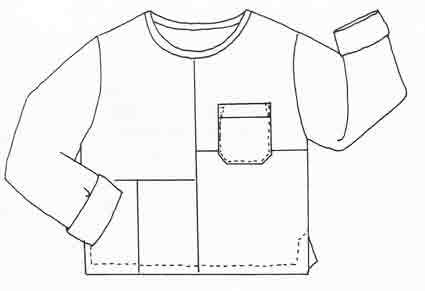 In its simplest form, the casual dartless block has front and back armholes the same, see my post on the casual dartless block. Obviously there are also more complex versions. 2. 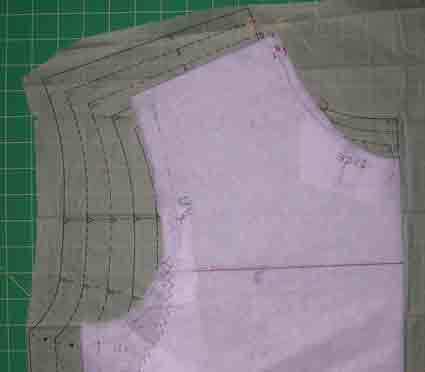 Starting from a fitting shell : as I say in the intro to this post, and have said many times before, there is no way of making a fitting shell that I have found, which gives me a good fitting basic without any further work. I have tried pattern making software, also several pattern making book block drafting instructions, and Sure Fit Designs. In each case, after following instructions to make a basic block, I had to do a lot of fitting work to get get it to fit well. So I might as well start from a commercial pattern, it involves no more work. In the case of pattern making software, it’s actually less work for me to start from a commercial pattern than to try to get software to fit. And as I have explained to you several times before, I do not have access to a good dressmaker to make a fitting shell for me. Most sewing tasks are complex and there are many different ways of doing them. Each sewer finds the methods that are best for them. There is no one way that is best for everyone.